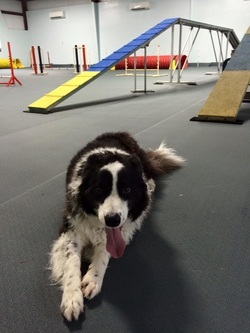 In its simplest form, an agility course consists of a set of standard obstacles laid out by a judge in a design of his or her own choosing in an area of a specified size. The surface may be of grass, dirt, rubber, or special matting. The surface at DePaw Dog Sports is an artificial turf specifically manufactured for Agility. It was designed to provide the best traction for both humans and canines while maintaining a sufficient amount of padding should a mishap occur. Use your basic skills to learn how to do each obstacle on the course. 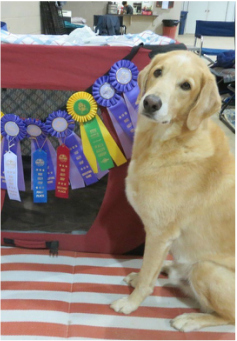 Connect with your dog as we show you the basics of handling. 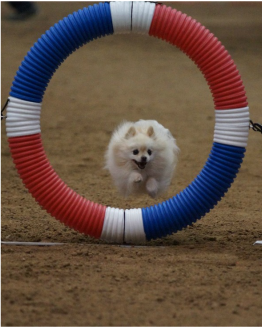 Refine your skills to be able to compete in Agility Trials.